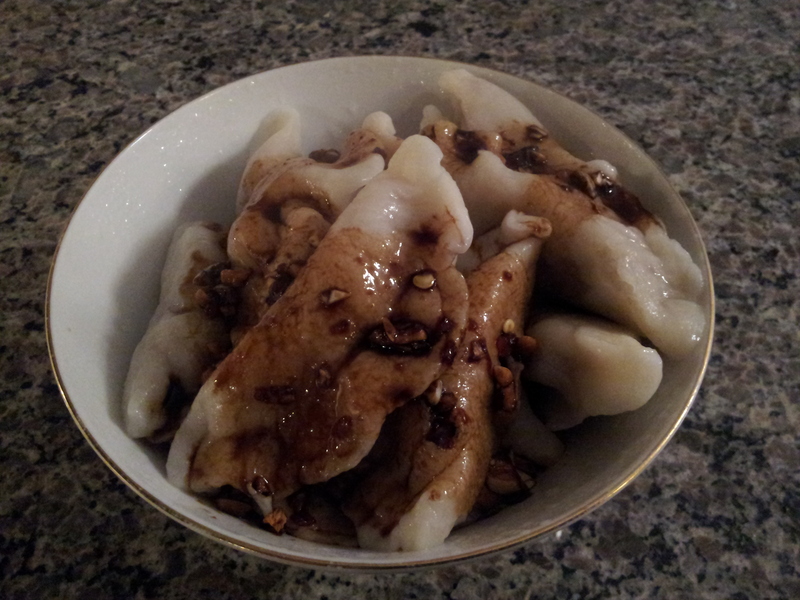 This recipe was made using the cookbook called Asian Dumplings by Andrea Nguyen. 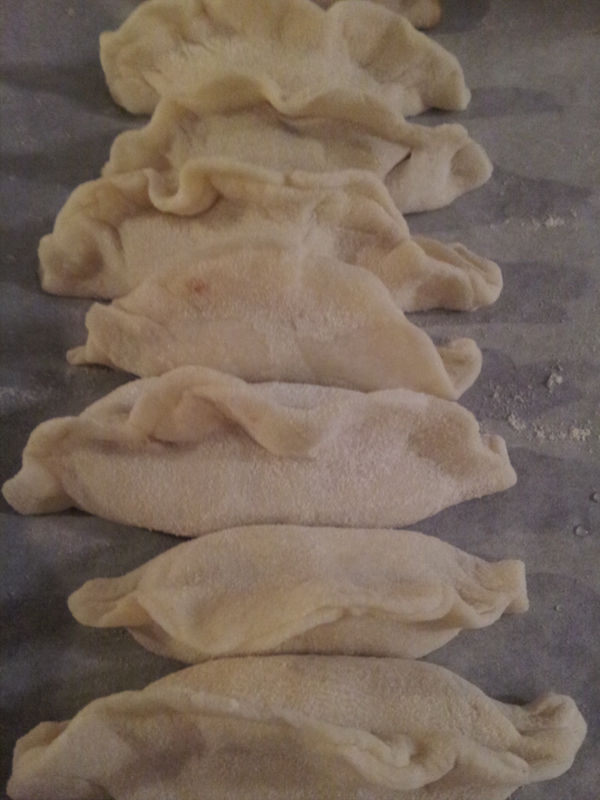 It was my first attempt at making dumplings, and they turned out quite well. Thanks to my brother James, and my sister-in-law Caroline for the Christmas gift! The nice thing about this recipe is that it makes a lot (about 32 dumplings), and they can be eaten as a snack, as a starter, or as part of the main course. You can even make soup broth and make dumpling soup! But, I’m getting ahead of myself; the broth is part of a different recipe. You can also freeze the dumplings, uncooked. Place flour in a large bowl and make a well in the centre. Add the boiling water and mix with a wooden spoon until combined. Knead the dough with your hands (folding it on top of itself, and then pushing with the palm of your hand) for about two minutes. By this point the dough is smooth and a little sticky. Place the dough in a zip-lock bag (it fits inside a sandwich-size) and set aside for 15 minutes, while making the filling. If making the dumplings later, keep dough in the fridge, and when about to use, allow it to reach room temperature. 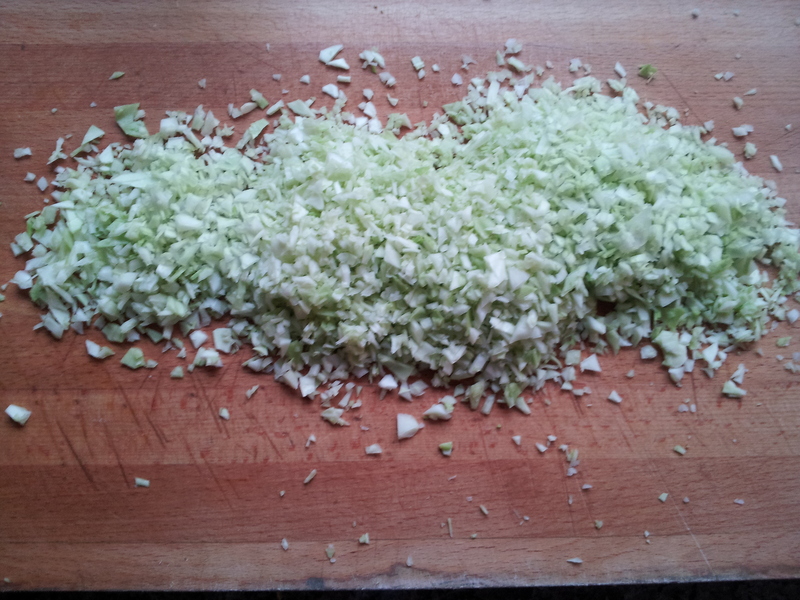 Add cabbage, 1/2 tsp salt, ginger, green onions, and pork to a bowl and lightly mash them together with a wooden spoon. 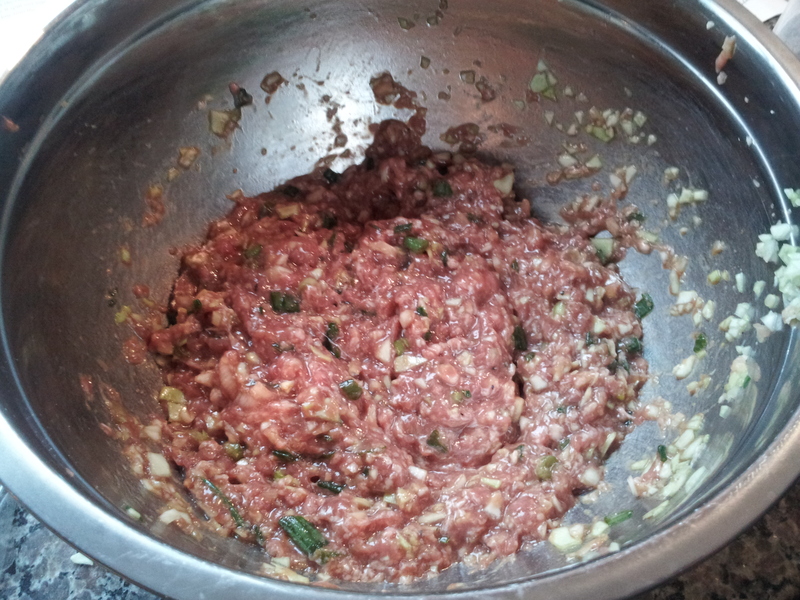 In a separate bowl, mix 1/2 tsp salt, pepper, chicken stock, soy sauce, port, canola oil, and sesame oil. Add this to the meat and mix together. The mixture should be uniform. Let it sit for at least 30 minutes to allow the flavours to develop. If you plan on forming the dumplings later, you can keep this in the fridge, and allow it to reach room temperature when ready to use it. Cut the dough in half and keep one half in the plastic bag. Lightly flour your surface, roll the other half of the dough to make a log about 1 inch thick, and cut into 16 pieces. Hint: cut it in half first, then cut those pieces in half, then those pieces in half. Use your hands to form each piece into a cylinder shape, so that they look like scallops. Then, use a flat, round surface, like the bottom of a big mug, to flatten each piece between two small sheets of plastic wrap. If you have a pita press, use this instead. Make sure to coat the piece of dough in a small amount of flour to prevent sticking. Flatten each piece of dough into a disk. Next, use a small rolling pin, or a round handle, to roll the edges of each disk outward. You want the centre of the disk to remain thick, and for the edges to be thin. Then, spoon about 1/2-1 tsp filling into the centre of the disk and press the edges together, trying to keep the filling inside. Lightly flatten the dumpling on the counter with the edges facing up, to form the shape of your dumpling. There are a number of other ways to shape dumplings, but this one is called half-moon. Bring a large pot of water to a boil and cook dumplings in batches of eight for eight minutes. The dumplings will float within a couple minutes, but remember that the meat still needs to cook. Remove the dumplings with a spoon that has holes in it, to allow excess water to drip off. Serve immediately. If you need extra time, place dumplings in a bowl and cover with a plate to keep them hot. Voila! I think when I make them next time I will flatten the dough even more to allow for more filling per piece of dough. Sesame oil without peanuts in it? SENSATIONAL.